Several times in the past few weeks, I have stopped in awe and taken the time to drink in the beauty of the Autumnal leaves. Their final vibrance and glorious colors painting the vast brilliant blue sky has made me fall in love with life again. With this joy also comes a deep sadness welling up inside of me knowing that our planet is in deep peril. We have such a short time to turn things around, I fear that we won’t be able to do it. The pain of this is so strong that it is unbearable. I know that I must do all that I can to arrest this catastrophe since I am alive now in this magnificent world and must do all that I can to take care of the Earth. I didn’t mean to get into this here, really I didn’t, but it weighs so heavily on me as I’m sure it does on all of you too. With our unstable political landscape and the looming climate issues, anxiety and uncertainty are reaching an all time high in my mind & body. In addition to all of this, it’s Fall which according to Ayurveda is Vata dosha season which heralds an increase of the air element in all of us. This Fall I’ve really been feeling my vata go out the roof! One of the signs of vata out of balance is anxiety. 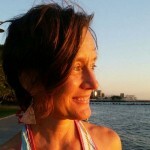 When our body mind system has too much vata dosha we feel ungrounded, unstable, and therefore anxious. To quell this anxiety, for the past few weeks I’ve been increasing my Ayurvedic self care practices. 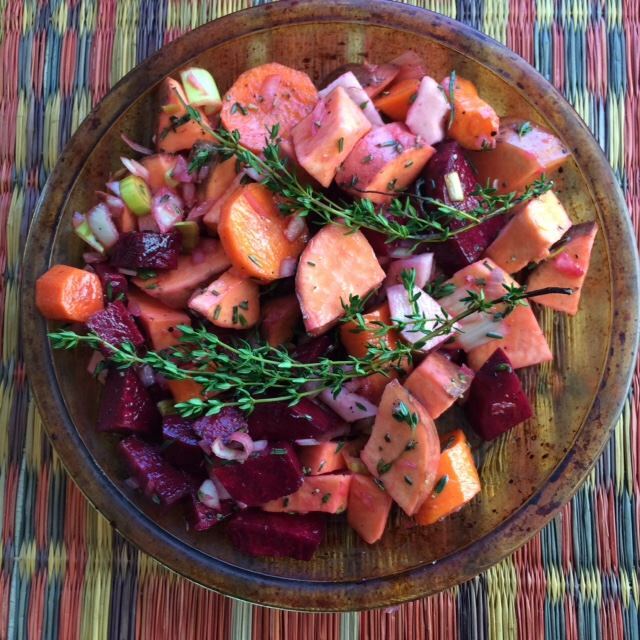 Knowing how important it is for vata dosha to eat grounding, nourishing foods, my first move was to cook my favorite Roasted Root Veggie Delight! This is my fav..carrots, sweet potatoes, beets, turnips, onions, leeks, fresh rosemary & thyme & olive oil – all from my sweet neighborhood farmers market in Greenpoint! Just dice it up & pop it in the oven to roast. Absolutely yummy & all those root veggies help ground the vata, air element, which gets out of whack in Fall. Easy to do! Ayurvedic wisdom in your kitchen & belly, bringing you nourishment, grounding and balance to your body & mind. Every night I’ve been curling up with a yummy warm drink & getting all cozy!!! This is really nourishing for vata dosha! 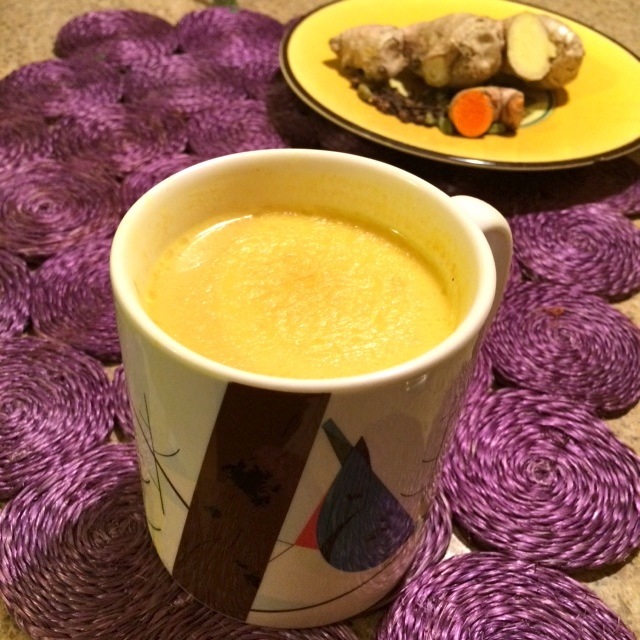 My favorite is Ayurveda’s elixir, Golden Milk. My nightly ritual has really been helping me sleep, stay grounded, and calm my anxious vata mind. Which is so important during this windy season and imperative in these turbulent times when strength, stability as well as creativity and vision are needed. 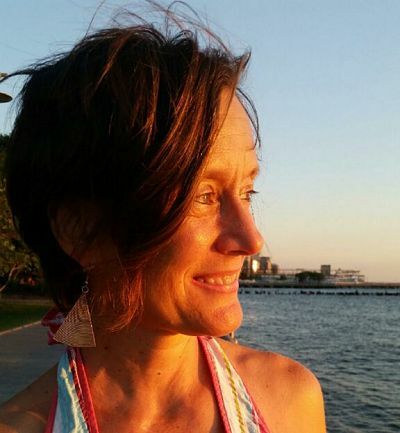 If you want to learn all about the doshas and Ayurvedic self-care practices to help you invite more health, well being, and balance into your life, please join me for my Ayurveda Teacher Training, Nov 10-12 at Sacred Sounds Yoga. This training is open to everyone. For the sensitive, delicate, creative vata types, the increase in the air element in the Fall often brings anxiety, nervousness, and hyperactivity to a high pitch. Are you feeling a bit scattered, overwhelmed, and fragmented this Fall. Is it difficult to focus and complete projects? Do you have insomnia? Do you suffer from arthritis or creaky joints? Is your digestion off? If you are experiencing any of these things, your vata dosha may be out of balance. Embrace rooting yoga practices this Fall, to help ground the windy air element. 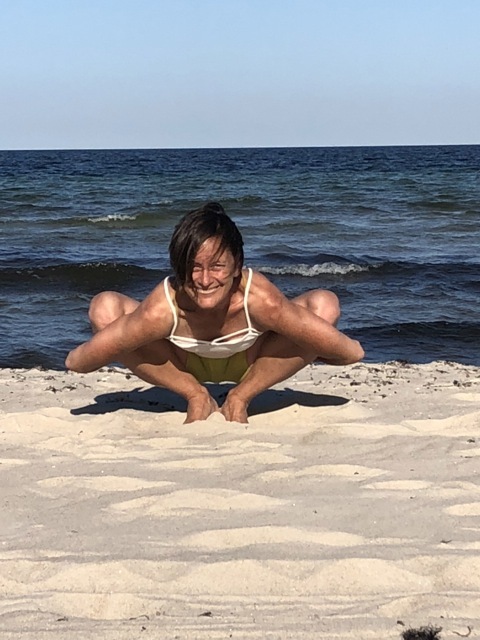 Invite steadiness and clarity into your mind by choosing poses that will deepen your connection with the Earth. Calm down the wind, by doing less vinyasa’s. Establish stability by staying in your standing poses for longer periods of time. Deepen your roots by waking up your feet, legs, and pelvis. Add more seated poses and forward bends in your practice to literally sit on the ground and anchor your windy distracted, fragmented mind. 2 Fall warm drinks for vata dosha! Happy Fall! Its windy and cold out there & vata dosha, the air element, is on the rise. Often when the wind picks up in the Fall, Vata dosha, the air element, goes out of balance. Our mind gets very active with ideas spinning a mile a minute. We feel like we want to do everything and be everywhere–We’re the wind after all! So we try to do it all, over plan our schedules and get totally overwhelmed, fragmented, and can’t get anything accomplished. Often as vata dosha goes out of balance, we have trouble falling asleep or wake up in the middle of the night and can’t get back to sleep. Sound familiar? This week as the leaves start turned turning glorious colors and the wind is picking up & blowing them off the trees, I’ve really been feeling my vata go out the roof . So what to do???? It’s time to curl up with a yummy warm drink & get all cozy!!! This will really help you stay grounded and calm the anxious vata mind so that your creativity and visionary brilliance can shine this Fall. I have two favorite warm drinks this Fall. India’s Ayuvedic gem, “Golden Milk” to help you get a good nights sleep and from the heights of Peruvian Andes, “Vegan Hot Maca Chocolate”, to wake you up in healthy style! To help me prepare for sleep, I’ve been drinking Ayurveda’s “Golden Milk” every night before going to bed. My friend, Jen Kuipers, gave me her favorite recipe and it is totally rocking my world! The gem of Indian medicine and cooking, Tumeric has incredible digestive, anti-inflammatory as well as antioxidant properties. Coupled with ginger and the spices, it becomes a digestive powerhouse and immune booster, as well as a magical sleepytime elixir! I’ve been drinking it every night. I love the ritual of grating the fresh tumeric & ginger and grinding the spices. The pepper unpacks and increases the benefits of the tumeric. Cardamom helps cleanse the body during the night with it’s detoxification properties. Cloves are a digestive stimulant as well as a great boost for the immune boost system helping release sinus & bronchial congestion. Cinnamon is also a digestive tonic. Nutmeg is an amazing sleep aid. The coconut cools all the heating spices down creating balance. I find it the ritual of making Golden milk comforting and helps me start to relax. Then I light some candles, and put some essential oils in my diffuser (lavendar, clary sage, geranium, and bergamot are my favs these days) and curl up on my couch and sip my “Golden milk”. It makes me deliciously relaxed and sleepy! Try it – You’ll love it! Heat up the milk and simmer. Grate the fresh tumeric & ginger and add to the milk. Grind the peppercorns, cloves and cardamon and add with coconut mana, cinnamon, nutmeg to the milk. Whisk until it becomes a gorgeous golden color. Strain & add honey. It’s deeeeelicious! 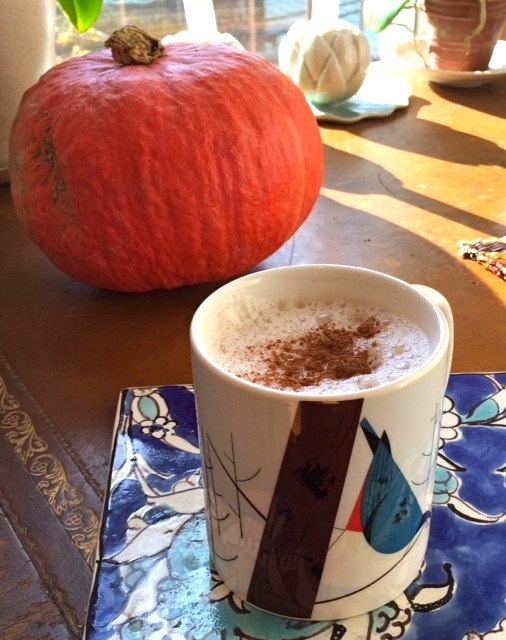 In the morning or afternoon, if you want a healthy picker upper which is a great alternative to coffee, try my other Fall favorite drink a yummy hot chocolate made with Maca, the Peruvian superfood. I’m drinking it right now to wake me up and let the words flow! Originating high in the Andes, maca root grows at 7,000 to 11,000 feet, making it the highest altitude growing plant in the world. Perhaps it is this ability to live in such an extreme environment, that creates the beautiful adaptogenic quality of maca which helps keep you balanced in times of internal or external stress. Esteemed for centuries for it’s healing properties, maca is a complete protein and packed with vitamins & minerals. Maca increases your energy by balancing the endocrine system so that it helps regulate your hormones. It is a gift for women’s health, helping to smooth the hormonal roller coaster the menstrual cycle and menopause. Maca increases libido and fertility, making this Superfood an exquisite elixir! Pour the liquid into your favorite mug and sprinkle some cacao nibs and cinnamon on top.